The big dilemmas of the day resist resolution. For decades we have relied on economics, science and the law for answers to pressing problems. But economics is not as rational as we hoped, science not as certain—even the law has shades of grey beyond the black letters. Excluded from policy forums, belittled in public life, the humanities and social sciences have become defensive and reactive. It is time for them to come out of the shadows. Climate change, population, globalisation, health, international order: all demand new approaches grounded in human behaviour and history, that learn from literature and philosophy, and draw on the creative imagination. We need a human-centred approach to our understanding of the complexity of systems—the flow of materials through economies, the flow of data from lab to laptop, the flow of ideas. Ways of Seeing explores the gaps, reinvigorating our curiosity and our desire for exploration. Philosopher John Armstrong examines the place of the humanities, arguing that this body of knowledge is too essential to be confined to academia. Other contributors include Peter Cochrane on the historical imagination, Robyn Williams on technology and complexity, Ian Lowe on certainty in science and Rod Tiffen on the perils of populism. Jane Goodall sees a new dawn in Bucharest; Robert Hillman faces a culture gap on a Melbourne tram; plus, there’s new fiction from Amanda Lohrey, and much more. 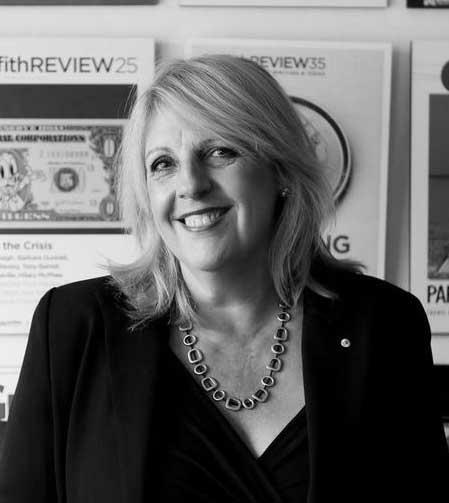 Julianne Schultz AM FAHA is the founding editor of Griffith Review, the award-winning literary and public affairs quarterly journal. Griffith Review is one of our country’s finest scholarly journals and the latest edition would have no trouble competing on an international stage. Interpreting its theme “ways of seeing” in the broadest and most eclectic sense, the journal brings together thought-provoking and articulate essays, outstanding memoir and creative work.